nestled at the foot of Table Mountain. 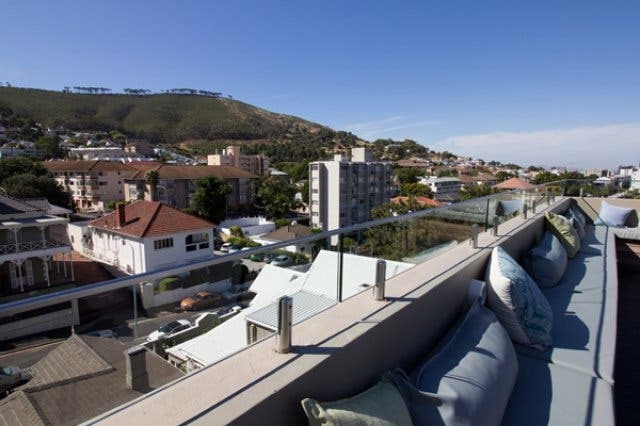 Cloud 9 Boutique Hotel & Spa is kicking things up a notch at its magnificent Cloud 9 Rooftop Bar. 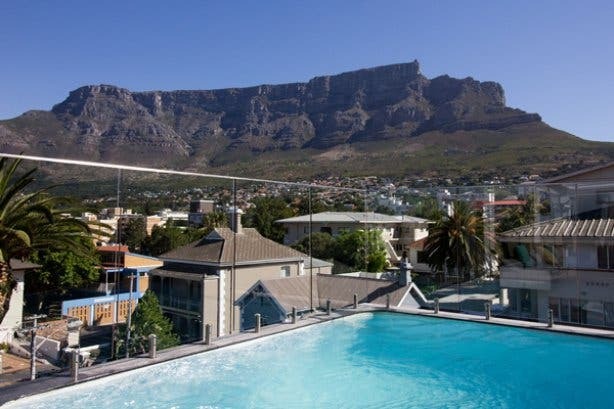 The lavish accommodation spot and wellness centre is adding extra time to the standard happy hour, inviting locals and visitors to its spectacular rooftop sun deck and bar between 3pm and 7pm every Wednesday for its discounted booze special. By cashing in on the deal, guests can enjoy two selected local beers and ciders for the price of one as well as all cocktails for only R45 each. While the hotel’s interior holds a chic, contemporary touch – think bold features and brightly coloured furniture – the rooftop bar aptly offers a relaxed style featuring an inside bar area with couches and a large television positioned above the bar as well as two sun decks; one presenting guests with under cover seating and a sparkling plunge pool with a retractable roof and the other – accessed by a flight of stairs – rewards visitors with impressive and uninterrupted 360-degree views of the Cape’s majestic Table Mountain and Signal Hill as well as the Mother City’s glorious cityscape. PIZZA AND COCKTAILS ON A ROOFTOP. NEED WE SAY MORE? As it is happy hour(s) after all, must-try signature cocktails include the Golden Dream (Cointreau, hazelnut liqueur, cream and orange juice) and the Amarula Colada (Amarula cream liqueur, white rum, coconut milk, pineapple juice). Other concoctions such as the Vanilla & Pear (vodka, vanilla and pear juice) as well as the Basil Grande (freshly muddled strawberry and basil leaves, strawberry puree and cranberry juice); also sound too good not to try. The bar too serves a wide selection of local beers and ciders – chat to the establishment’s expert barmen for brew suggestions. While sipping on refreshing mixes or local ales, guests can tuck into a light bite from the bar’s pizza offering. Every one of the items on this menu pays tribute to a local landmark, for example, try the Robben Island which contains salami, olives and red onion. 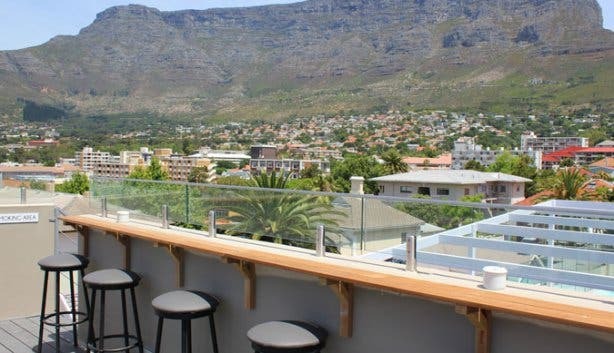 What’s more, Cloud 9 Rooftop Bar is open to the public, this means all guests – no matter whether they’re staying in the chic inner city boutique hotel or not – can revel in the never-ending views and delectable cocktails and brews. And if fruity mixes and malty brews are not your thing, the bar also boasts a grand selection of reds, whites and bubbly. 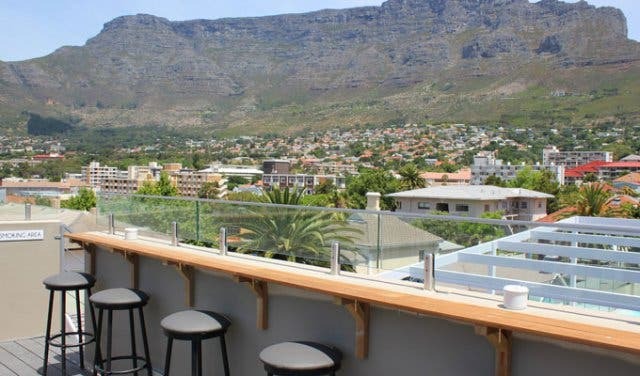 Every Wednesday from 3pm to 7pm at Cloud 9 Rooftop Bar all cocktails are R45 each (originally R60 each) as well as local beers and ciders 2-for-1. Should you wish to book or to find out more information, please call +27 (0) 21 424 1133. Check out our full feature about Cloud 9 Boutique Hotel & Spa. Expect unparalleled, 360-degree views of the city from its stylish rooftop bar. Keen to unwind and pamper yourself? 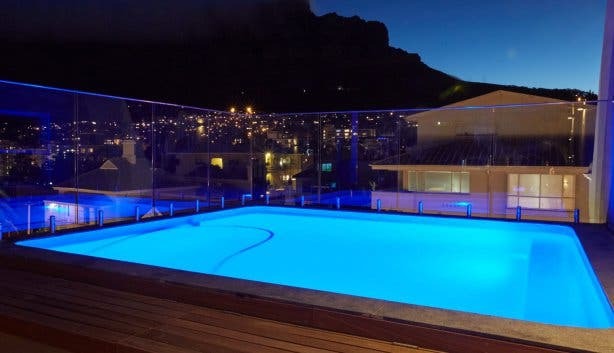 Look no further than the Deluxe Laser & Spa at Cloud 9 Boutique Hotel & Spa. Take this experience to the next level by having a spa treatment with bubbly.